"But there is more of interest to this tree than its unusual size and length. It is Bridgeport Tom's tree that has at last fallen, and in this fact alone there is a story to tell which should awaken the memories of the old timers of the valley. A young Paiute Indian surnamed Tom, skilled in breaking and training horses in his early days in the valley when he worked for Coffman and Kenny on a settlement near the present Ahwahnee Hotel. In the off-season periods he operated a horse ranch near Mono Lake, where he raised and trained horses. Bridgeport Tom was famous in his younger days as an enthusiastic horseman who entered many racing events held on holiday occasions in this area. In his later years he is described by his daughter, Lucy Telles, as "not a medicine man" but a man who could "heal through the spirit." His connection with the great old yellow pine came about when he declared it his favorite tree in the valley and prophesied that he would die when it died. No one knew the exact age of Bridgeport Tom when death claimed him on November 24, 1935, at Coleville, California. He had been in evidence in Bridgeport and in Yosemite for at least 80 years. As for his favorite tree, it is far more difficult to write a death certificate indicating the moment of death for a tree than for a man, but we do know that the big pine did die fairly close in the time to Old Tom." 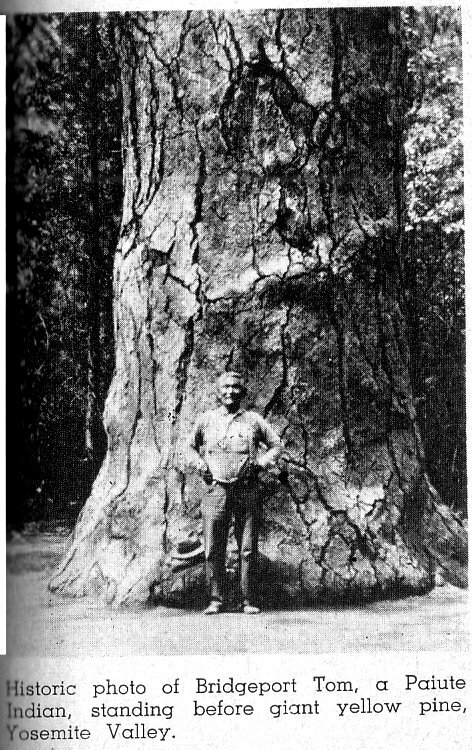 The old yellow pine and Paiute Bridgeport Tom will always be a part of Yosemite National Park's history. Bridgeport Tom, a Paiute man who loved that old yellow tree, would travel back and forth from Coleville, Mono Lake and Yosemite. Bridgeport Tom never lived around western Mariposa County. He resided in the Paiute areas and traveled the old ancestral Mono Paiute trails that Chief Tenaya and the Ahwahneechees did. Note: Bridgeport Tom was the father of many of the famous Yosemite - Mono Lake California Paiute basket makers. Coleville, Bridgeport and Mono Lake are Paiute areas, like Yosemite Valley. Bridgeport Tom was the ancestor of Southern Sierra Miwuk leaders Jay Johnson, Tony Brochini, Della Hern, Helen Coats, Julia Parker's husband Ralph, Amy Rhoan and other elders. Yet he was a full blooded Paiute.